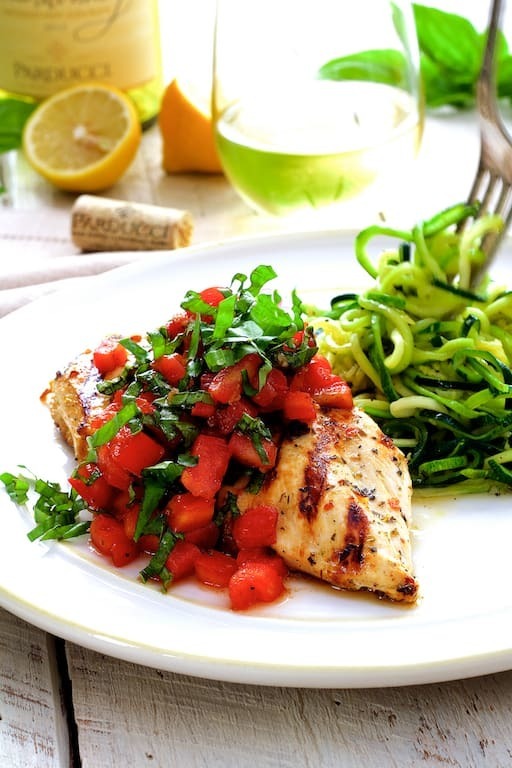 Chicken Bruschetta with Zucchini Noodles is light, fresh and easy with fresh, vine-ripened tomatoes, sweet basil and zucchini. Combine first 7 ingredients in a 1-quart zipper-top bag. Add chicken, squeeze out excess air and marinate in the refrigerator for 1 hour. Preheat a grill or grill pan over medium-high heat. Remove chicken from marinade; discard marinade. Place chicken, top side down on grill. Reduce heat to medium. Grill 6-7 minutes per side or until cooked through to 165 degrees. Combine tomatoes, garlic, oil, balsamic vinegar and salt and black pepper to taste in a small bowl. Let stand while grilling chicken. Just before serving, stir in fresh basil. Serve atop chicken. Heat olive oil in a large skillet or sauté pan over medium-high heat. Add the zucchini and cook 2-3 minutes or until starting to soften. Season with salt and black pepper to taste. Serve with lemon wedges.